Please note that due to Major roadworks involving the re-decking of Waterloo Bridge to be carried out by Aberdeenshire Council it will be necessary in the interests of public safety to apply the following restriction to traffic. A recent assessment of the B9005/90 Waterloo Bridge confirmed that it requires an 18tonne weight restriction or major strengthening works. As this bridge is on a B class road that serves as an important cross country link between Methlick and Fyvie, it has been decided that a strengthening scheme is the preferred option. The proposed works are to consist of the temporary diversion of the existing telecom cable, removal of the existing substandard concrete bridge deck, and the strengthening of the retained existing masonry abutments and wingwalls. New precast concrete deck slabs will then be lifted into place, before the masonry parapets, telecom cable ducting and surfacing are reinstated. As part of the SEPA Simple Licence associated with these works, it will be necessary for construction to be completed prior to the fish spawning season, which starts in October. To this end, we have programmed the proposed works to start on site 16th July 2018 with an 11 week duration. This start date has been chosen to maximise the school holidays but also allow the annual Methlick Cycle Challenge to continue without disruption. The B9005 will need to be temporarily closed at the bridge for the duration of the works. A signed temporary diversion will be put in place. As these works will require the removal of the bridge deck and the use of heavy plant on site, we will be unable to provide any exemption to the closure; this precludes pedestrian access. The alternative route is via B9005 Monkshill to Fyvie, A947 Oldmeldrum, B9170 to Methlick and vice versa. New prizes added for Alannahs, mega lucky square at £5 a square. – Climbing for 2 at Transition Extreme. – Fishing for 2 at Lochter. – A gift box from Walkers Shortbread. – A gift card from Tesco’s. – A £20 voucher for Skyline Trampoline Park. – A £50 Slaters voucher. – Tea for 2 at Aden Country Park. – A gift box from Deans Shortbread. Please contact me if you want a square through Facebook or any other means. Let us know what prize you would like. The lucky square will be pulled on the 22nd of June. Unfortunately, due to a lack of commitment and an insufficient number of ticket sales, the race night not will not be going ahead. Any tickets sold will be refunded. 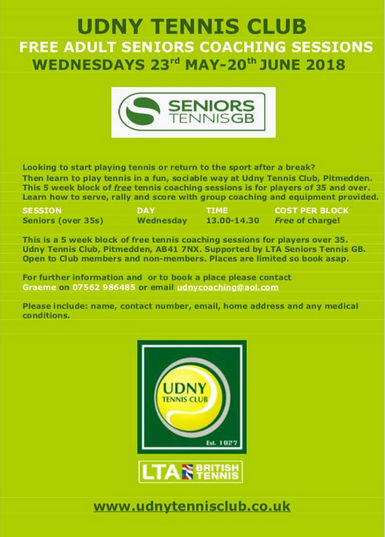 CLICK ON THE POSTER TO READ ABOUT THE FREE SESSIONS.